Simon (Sam) Metcalfe was born on February 17th 1887, and his younger brother, Thomas Edward Metcalfe, was born on 14th June 1890. The brothers were two of four children of Thomas and Elizabeth Metcalfe, who farmed at Low Foss, Raydaleside, in Wensleydale. Their parents died when the boys were quite young: their father in 1898 and their mother in 1901. As a consequence of this, the siblings were split up - though Thomas only moved next door to live with Robert Ewbank, who had the other farm at Low Foss. As an adult, Thomas found work at Coleby Hall. He had a relationship with Isabel Mason Scarr, daughter of James Scarr, of Coleby Hall, the outcome of which was that Isabel became pregnant and gave birth to a boy, Eric Metcalfe, at Dale Grange on 10th February 1912. Isabel’s family shunned the couple and their newly born son. Probably as a result of this familial falling out, Thomas and Isabel took their son and relocated to Liverpool. Isabel was a childhood friend of Margaret Bell of Semerdale Hall in Raydaleside, and it was with her they went to stay. Margaret had married Alexander Lambert of Brough Hill, Bainbridge, who had taken over the running of a milk house at 177 Boaler Street, Liverpool from his uncle Robert H. Lambert. And it was from 177 Boaler Street that Thomas and Isabel were married on 31st August 1914 in St Philips Church, West Derby. The witnesses were Isabel’s sister, Margaret Ellen Scarr, and Thomas’s older brother, Simon, who was keeping cows and selling milk at 39 Lower Breck Road. 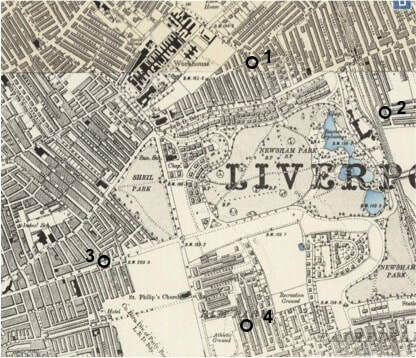 The Metcalfe Brothers' Dairies around Newsham Park, Liverpool: 1) 39 Lower Breck Road; 2) 98 New Road; 3) 177 Boaler Street; 4) 23 Onslow Road. ​After the wedding, Thomas and Isabel moved into a property at 23 Onslow Road, Liverpool, and Thomas began working in partnership with his brother. As a married couple they experienced mixed fortunes with regard to raising a family. Baby Eric died of meningitis and kidney failure, on 30th October 1914, aged just 2 years. Then, another baby boy, Thomas Metcalfe (known as ‘Sonny’), was born on 15th May 1915, followed by James Metcalfe on 22nd September 1916. Sadly, new baby James died on Christmas day 1916, from acute bronchitis, aged just 3 months. But, a baby girl, Gladys May Metcalfe, was born on 2nd September 1918. In 1916, Thomas opened a dairy of his own at 23 Onslow Road. The brothers continued to work in partnership – Thomas may have kept cows or he may have just sold milk from his brother’s herd. 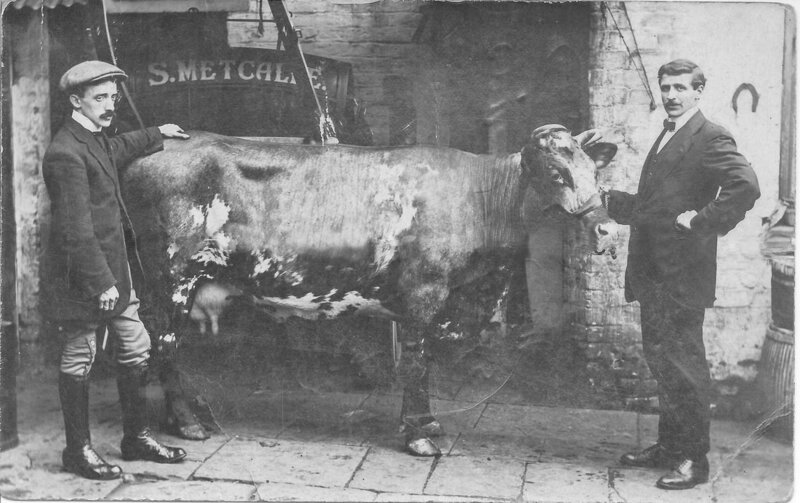 They were also cattle dealers and Simon would go regularly to Ireland to buy stock, returning with up to 100 cows at a time, either for their own use or to sell to other cowkeepers. This family partnership continued until 1919, when Simon married Clara Kate Povey on 16th June at the Church of St Margaret, Belmont Road, Walton-on-the-Hill. The witnesses were Peter Edward Close and Dorothy Willis. Peter Close was the son of James and Ann Close, who had moved from Marsett, Wensleydale, to run a dairy at 50 Lombard Street. Simon took full ownership of the dairy at Lower Breck Road, and Thomas and Isabel moved to a larger dairy at 98 New Road. However, this new arrangement did not last long. On 14th February 1920, Thomas’s daughter, Gladys, died from membranous croup. This prompted Thomas to move his remaining family – wife, Isabel and son, Thomas - out of the city. He was able to rent Scar Top Farm, back in Wensleydale, where on 16th September 1920, Isabel gave birth to a new baby daughter, Annie Margaret (Peggy) Metcalfe. Later that year, back at Scarr Top, Thomas and Isabel lost their son, Thomas Jnr. (Sonny), who died on 6th June 1922, after suffering from bronchitis and muscular dystrophy, aged just 7 years. The couple then had another boy: Carl Metcalfe was born on 15th September 1924. Meanwhile, economic depression was badly affecting the farming community. Thomas was unable to sell his milk and became extremely depressed. His friend, Alexander Lambert, had returned from Liverpool and was working the neighbouring farm at Brough Hill. Despite the best efforts of Alexander, who called in daily to check on his friend, Thomas succumbed to his depression and took his own life, on 4th October 1926. Isabel moved out of the farm to stay with her sister and brother-in-law, Margaret and James Peacock, who lived in Bainbridge. Isabel was pregnant at the time of her husband’s death and Thomas Edward (Tucker) Metcalfe was born on 1st March 1927 at West View, Bainbridge. When the farm stock was sold, Isabel bought Low Blean Farm, near Semerwater, where Carl eventually farmed. Isabel Mason Metcalfe died on 30th June 1963; she was 70 years old.